Provost Jonathan Holloway. Holloway appeared at Wednesday’s Faculty Senate meeting to discuss the University’s financial future after a $94 million deficit in fiscal year 2018. 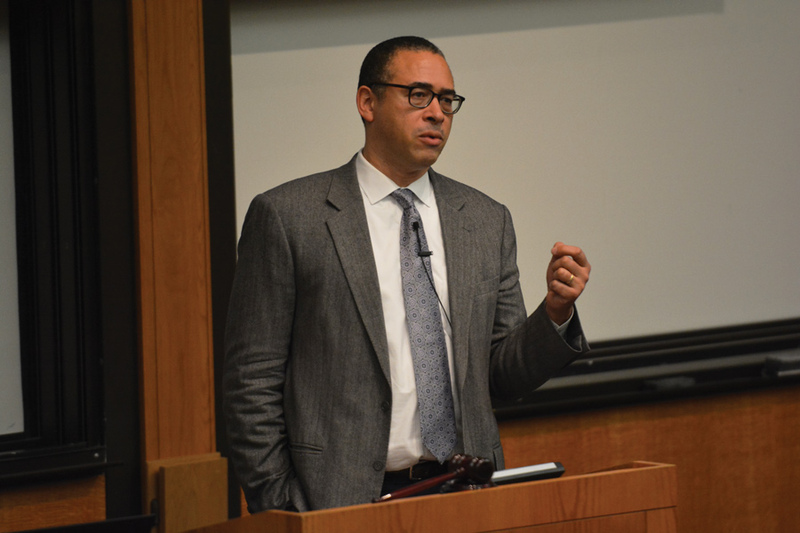 Northwestern drew $100 million from its endowment to resolve the $94 million budget deficit from fiscal year 2018, Provost Jonathan Holloway told Faculty Senate on Wednesday. The deficit first became public when Holloway announced it at a January 2018 Faculty Senate meeting. At the time, the deficit was estimated to be between $50 million and $100 million. Estimates during the winter and spring approached $130 million, but has since stabilized to give a more positive financial outlook. To counteract a continuing operating deficit, the University will draw another $50 million from the endowment in fiscal year 2019, which began in September 2018, and $25 million in fiscal year 2020 before returning to typical budget procedures in fiscal year 2021, Holloway said. The University’s overall financial position remained strong, Johnson maintained, though the acquisition of $500 million of taxable debt in October 2017 increased its total debt to $2.5 billion. The University’s status had been placed on notice by the three largest credit rating agencies when it issued the bonds, Johnson said. NU retained its AAA credit rating from Moody’s last September, making it one of few universities with a top-tier credit rating. But the rating agency revised its outlook for Northwestern to “negative” from “stable” after expressing concern over the University’s cash flow. “Our perch at the top is a little bit at risk, and it’s something we’re monitoring,” Johnson said. Holloway said the University planned to continue stringent budget procedures adopted in response to the deficit, changes he said would improve accountability and communication. “We have much more robust financial systems in place,” Holloway said. “We have much better controls in place and better information flowing from the departments to the school administrations to The Center,” he added, referring to the central administrators. The University is also in the process of formulating a seven-year capital improvement plan that will factor into all future financial decisions. Holloway said Johnson will present this proposed plan to the Board of Trustees in June. The meeting marked Holloway’s second annual presentation of University finances at Faculty Senate. Holloway first appeared at Senate in January 2018, when he announced the estimated deficit. The deficit ultimately resulted in NU laying off about 80 staff members and eliminating around 80 funded positions. It also delayed multiple construction projects, including the completion of Mudd Library and the Chicago campus’ Simpson Querrey Biomedical Research Center. New projects like the Donald P. Jacobs Center and Norris University Center are also on hold. Senators questioned Holloway and Johnson after their statements, raising concerns about recent cuts to department budgets. Johnson and Holloway acknowledged these concerns, and said the cuts were determined by department and school heads — not central administrators. Holloway said that the purpose of his and Johnson’s appearance was to demonstrate the closer partnership between the Provost’s Office and the Office of the Vice President for Business and Finance. “Their presence showed an indication of their willingness to communicate, and they dealt very constructively with questions from the humanities and professional schools,” he said. The future of several construction projects was left uncertain. Holloway said unless Northwestern can find donors, Norris’s renovation will remain stalled.